PARIS — The Intelsat IS-19 telecommunications satellite has sustained permanent damage to its south solar array that will cut the power delivered to the satellite’s payload despite the array’s recent deployment, according to industry officials. 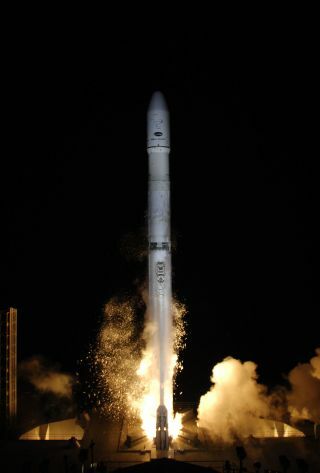 The array, which remained stuck in stowed position13 days after its May 31 launch, was deployed in orbit on June 12 after the spacecraft had completed its climb from its transfer orbit to geostationary orbit, Intelsat said in a June 14 statement on the satellite’s status. But while its deployment will make it easier for Intelsat to fly the satellite and will reduce excess fuel consumption, the damage the array sustained at some point during the launch will reduce its electrical output by a yet-undetermined percentage, officials said. One official said it looked like half the array’s power-generating capability might be intact, which would mean IS-19 has 75 percent of the total electric power it was designed to use during its 15-year life. Dianne J. VanBeber, Intelsat vice president for communications, said June 19 that the company would await further testing before issuing a statement on the satellite’s health. Intelsat 19 was built by Space Systems/Loral of Palo Alto, Calif. It was launched May 31 aboard a Zenit 3SL vehicle operated by Sea Launch AGof Bern, Switzerland, from a floating platform on the equator in the Pacific Ocean. Sea Launch said after the launch that sensors inside the rocket’s fairing detected an unexplained pressure event 72 seconds after launch — similar to an event that occurred in 2004 with the launch of another Space Systems/Loral satellite whose solar array never deployed. Space Systems/Loral said that, for its part, it noticed that the outer solar panelon the satellite, which was exposed to the sun after the fairing was jettisoned during the rocket’s in-orbit coast phase, was registering less power than expected even before the spacecraft was released by the rocket’s upper stage. The 2004 anomaly was never satisfactorily resolved despite an extensive investigation. Sea Launch and Space Systems/Loral to this day disagree on what transpired.